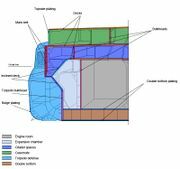 Armor in World of Warships is not just a uniform barrier to be pierced (like in WoT), but rather a kind of multi-layered “cake” that covers a number of construction elements and mechanisms, each having specific armoring. A projectile that enters the ship can encounter up to four or five layers of armor and may stop or ricochet at each layer. In this regard the developers attempted to adhere to historical realism and simulate all significant layers of armor. The armor tends to be very heavy: on a typical battleship it takes up around 40% of the total displacement of the vessel. Therefore, some later battleship designers tried to save some of that weight by placing heavy armor only around the vital parts of the ship: the ammunition and propellant magazines, the propulsion plant, the fire-control, command and communications sections. Most of the other compartments are almost completely unarmored. This approach of providing either total or negligible protection is referred to as "all or nothing". In effect, the scheme accepts vulnerability to medium-caliber and high-explosive shells striking the unarmored sections of the hull, in order to improve resistance against the heaviest armor-piercing shells, while at the same time being able to carry a powerful armament and retain useful speed and endurance. From the citadel box, shafts known as barbettes lead upwards to the ship's main gun turrets and conning tower. The ship's magazines are located in or around the turret barbettes, and contain the main caliber shells, as well as the gunpowder charges. Penetrating the citadel armor around the magazine often results in a spectacular one-shot kill. See also: Damage Saturation for an in-depth explanation. A ship has to be both a military base and a combat vehicle, since it is designed for long autonomous operations. Therefore a significant portion of the ship's interior space is needed for the every-day activities, but has no direct effect on ship's fighting capacity in the critical moments of the battle. 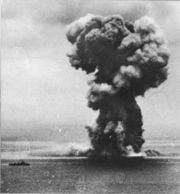 A shell that destroyed the ship's laundry room or the galley in an artillery duel would have much less of an immediate effect on combat capability than a shell that hit the magazine or the engine compartment. That is why, unlike the vehicles of World of Tanks, ships in World of Warships are divided into multiple compartments, each with a different value of hit points (HP). Damage is "dealt" to a compartment by subtracting a certain amount of hitpoints. The compartments are as follows: bow end, aft end, citadel, casemate (center part minus the citadel), and the superstructure. In addition, each ship's model in the game is assigned another, virtual compartment called "entire hull". The total hit points value for all these compartments combined is slightly more than the ship's nominal hit point pool. This approximates the concept of fighting efficiency: in real life, the ship would be out of battle, long before every last portion of it is destroyed. Each compartment (except the citadel) has two thresholds, where after each one is reached the damage it receives is reduced. The threshold levels for each compartment of each ship varies. In the initial state, the ship will receive damage normally (x0.33 for shell penetration). The compartment starts off clean and gets darker as it takes more damage. After the first threshold is reached, the damage received is halved (x0.165 dmg for shell penetration). At this stage, the compartment of the ship is visually blackened. Finally, once the second threshold is reached the compartment stops receiving damage, an effect known as damage saturation. There is no visual difference to the first threshold, you'll only notice that your shells stop doing damage to the compartment. Regardless of the state of the compartment, over-penetration will always deal x0.1 dmg and citadel hits will always deal x1.0 damage, even after the compartment's HP pool is completely depleted. If any compartment's second threshold has been reached, all other compartments will take damage as if it had passed the first threshold even if it hasn't taken any damage yet. Damage from fire, flooding, ramming, over-penetration and citadel hits will not reduce any compartment's HP pool (but they will still reduce the ship's total HP as normal). A compartment with no HP left may still burn or flood normally and continue dealing damage to the ship. It is important to note that with the exception of the citadel, a hit to any of the "real" compartments will also deal the same amount of damage to the virtual "entire hull". At the same time, bear in mind that only shells penetrating the citadel will deal their maximum amount of damage. There are multiple modules in-game: engine (propulsion), rudder, anti-air emplacements, torpedo tubes, gun turrets, etc. The modules have three states: functioning, damaged, and destroyed. A damaged module loses function until it is repaired, a destroyed module cannot regain function. Some modules can only be damaged but not destroyed (e.g. propeller), other modules can only be destroyed but not damaged (e.g. AA emplacements). Each module has a certain amount of HP. Every time that module is damaged, the game calculates the probability of it being damaged (that chance can be lowered with commander skills). The probability of a critical hit that leads to damage increases for lower module HP values. Once the module reaches zero HP, it is destroyed. The ballistic models for AP and HE shells are identical; however, some ships have different muzzle velocities between their HE and AP shells. Shell's in-game tracer may not coincide with the actual trajectory, in order to better visualize the shooting process. These shells have an instant fuse and burst immediately upon hitting a target. In addition to any direct damage, HE shells are good for knocking out modules, particularly deck mounted ones like AA emplacements, as well as starting fires, which can deal a large amount of damage over time if not extinguished. Like AP shells, HE does zero damage on shatters, 1/3 damage on normal penetrations, and max damage on citadel penetrations. Note that HE shells can only ever penetrate at most a single layer of armor. This can cause them to score a regular penetrating hit rather than a citadel hit if they strike another layer of armor first, no matter how thin the two layers are. This is an advantage of some spaced or turtleback armor schemes. In some cases, when they hit an "empty" section of the ship such as a torpedo belt, they can even fail to do any direct damage at all. Start with the shell diameter in mm. Round to the nearest integer, with X.5 usually rounding up, though even this is not consistent. This is the shatter threshold, the minimum armor thickness in mm needed to shatter the shell. If the commander has the Inertia Fuse for HE Shells skill, multiply the original (stock) shatter threshold by 1.3. Do not round again. See this article for some key thresholds. If the thickness of the armor is equal to or greater than the shatter threshold, the shell shatters. On the other hand, if the shatter threshold is strictly greater than the thickness of the armor, it penetrates. Example: Cleveland has a shell diameter of 152 mm. Dividing 152 by 6 gives an HE penetration value of 25.33 mm, which is rounded to 25 mm. Thus, any armor plate of 25 mm or thicker will shatter her shells, while armor of 24 mm or thinner will be penetrated. With IFHE, that value increases to 25 mm * 1.3 = 32.5 mm (not rounded). Thus, with IFHE it would take at least a 33 mm plate to shatter her shells, while armor of 32 mm or thinner would be penetrated. Example: Shchors has 75 mm of citadel armor. Therefore she can shatter normal HE shells of up to (75 + 0.5) * 6 = 453 mm diameter, but she would be citadelled by shells of 454 mm or larger. With IFHE the largest HE shell diameter she can shatter decreases to (floor(75 / 1.3) + 0.5) * 6 = 345 mm, with HE shells of 346 mm being able to citadel her. British battleships, German cruisers, and German battleships without IFHE can citadel Shchors with shells exceeding 302 mm. With the addition of IFHE, such ships can citadel her with shells exceeding 230 mm diameter. Unlike HE, the AP shell does damage only if it penetrates the armor. The fuse of the AP shell is initiated after it passes through armor, and historically the fuse times were calculated in a way that would allow the shell to explode after traveling about ten or so meters after passing through the armor; that way the shell exploded around the middle of the battleship. That means that when AP shells are fired at lightly armored and relatively small target, they might over-penetrate -- explode once they passed through the entire ship, or not even explode, if the shell doesn't encounter enough armor to detonate. Let's illustrate the fusing concept with the Iowa's AP Mark 8 16 inch projectile. Its Mark 21 Base Detonating Fuse (BDF) had a delay of 0.033 seconds. Fuse activation requires a resistance equal to 1.5 inches (3.8 cm) of armor at 0 degrees obliquity or 0.375 inches (1 cm) at 65 degrees obliquity. The muzzle velocity for a new gun and a full charge is 762 meters per second. Therefore, if the shell were to immediately hit an armor plate 1.5 inches thick after exiting the barrel, it would explode 762*0.033 = 25 meters after passing through that armor plate. Most AP shells in game have a fusing time of 0.033 seconds, but there are shells with as much as 0.1 second fusing time. As of patch 0.3.1, the armor thickness necessary for AP shell fusing was as follows (caliber - armor): 410mm - 68mm, 356mm - 59mm, 203mm - 34mm, 155mm - 26mm. As of 0.7.6, no ships have "worse" angles. *Due to this setting, Tachibana's AP will never ricochet. This is not a bug. Penetrations deal x0.33 of the shell's listed damage. Whether AP or HE, it must penetrate the armor and detonate inside the ship. Over-penetrations deal x0.10 of the shell's listed damage. Over-penetration is when a shell penetrates the ship through-and-through, before it has a chance to detonate inside the ship. Theoretically HE will never over-penetrate due to its low detonator threshold and shorter fuse. Citadel hits will always deal x1.0 of the shell's listed damage (though citadel over-penetration is still possible, and will only deal x0.10 damage). It is impossible to get a citadel hit on a destroyer, as they no longer have them per se (it was removed in 0.2.4/0.3.0). Prior to 0.4.1, penetrations on a destroyer's midsection will deal x0.5 of the shell's listed damage (in lieu of the absence of citadels), however this is no longer the case and penetrations to it will deal the standard x0.33 of the shell's listed damage. Properly angling the ship matters a great deal when the enemy is shooting AP shells: when an AP shell encounters armor at an angle, it has to pass a greater amount of armor for penetration. Additionally, at certain critical angle (below ~20-40°), the shell will simply ricochet, even if it might have ad enough armor penetration. A shell may still cause damage after the ricochet, but only to the same ship. 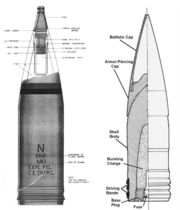 If the armor thickness is less than 1/14.3 of shell's caliber, a ricochet does not occur regardless of armor encounter angle. This phenomena is called overmatching. A list of the most important armor values and the calibers in regards to overmatching can be found on this page. AP shells can penetrate ship's armor even below the waterline, after traveling through water. The illustration to the right depicts a typical underwater trajectory of an AP shell: (1) - shell enters the water and is fused due to rapid deceleration (2) - trajectory angle changed (this happens every time an AP shell hits water) (3) - after a short delay, the fue explodes the shell. The image also demonstrates two outcomes of an underwater hit: armor penetration, and a ricochet. As of 0.4.1 the underwater hits do not cause flooding. An AP shell that ricochets after penetrating armor will cause another instance of penetration damage in the section where the ricochet occurs. Additional ricochets will cause additional instances of penetration damage until the shell exits the ship or explodes from fuse activation. This extra source of damage is most commonly encountered when shooting at "turtleback" armor schemes (common on all German battleships and other nations' dreadnoughts). Plunging fire that is insufficient to penetrate interior decks may also ricochet, causing one or more extra instances of damage. As a general rule, secondary guns fire HE. Ones that fire AP did exist, but have been replaced by HE in patch 0.7.11. Secondaries aim at enemy ship's mid-ship waterline. At comparatively long ranges, dispersion causes shells to scatter onto other parts of the enemy ship. However at close ranges, secondaries will likely hit the main belt of the enemy ship. In this case, unless the enemy ship has no belt armor, HE secondaries would usually shatter. Shooting other battleships with AP is most effective with direct fire at point-blank and medium ranges, roughly up to ~10-12 kilometers. The enemy battleship shouldn't be at too great of an angle; ideally, it should be perpendicular to your line of fire. You might also get some citadel hits with plunging fire at maximum fire ranges. If you aren't positive that you have a good chance of penetrating the citadel, HE shells are a better choice. Against lightly-armored cruisers and carriers, you should be using HE shells -- they have enough armor penetration to damage citadels. However, some carriers have enough armor to resist HE, and AP should be shot at them. It must also be noted that an AP shell can deal much more damage against a citadel. You should also use HE against destroyers -- AP shells will almost always over-penetrate; and HE shells will knock out multiple modules on a DD, giving you a high chance of disabling it even if it doesn't kill. One last thing: it's better to use the shell of the wrong type (e.g. AP against a destroyer that suddenly materialized near your ship) than to start a long half-minute reload. Sub-optimal damage is better than no damage at all. Against battleships your best bet is HE shells. Consistent HE hits and nonstop fires are a bane of many battleship drivers' existence. However, don't try to fight a battleship single-handedly; a skilled BB driver can dispatch you in a few well-aimed AP salvos. At point-blank ranges and favorable angles you can also try to penetrate the battleship's citadel with AP shells, though it's generally not a good idea to be that close to a battleship in the first place. When driving most destroyers, your main weapons should be your torpedoes (especially so if you're driving an IJN DD). However, HE shells can still be very useful when fighting other destroyers, or providing additional fire against enemy capital ships -- in the latter case, your shells won't be doing much damage, but you can make up for that with the sheer number of shells, and fires. AP shells can sometimes be used against lightly armored enemy cruisers and carriers, since you have just enough armor penetration to defeat their citadel armor, and can also sometimes be used against other Destroyers because of their higher damage (although they will not destroy modules like HE shells do). If the shooting distance is below the maximum range, the horizontal dispersion value decreases accordingly. Horizontal dispersion values at distances other than maximum firing range, as well as the vertical dispersion values have not been made public by WarGaming. However, based on the user collected data we know lines of tech tree ships are tied to specific formulas to determine horizontal dispersion. 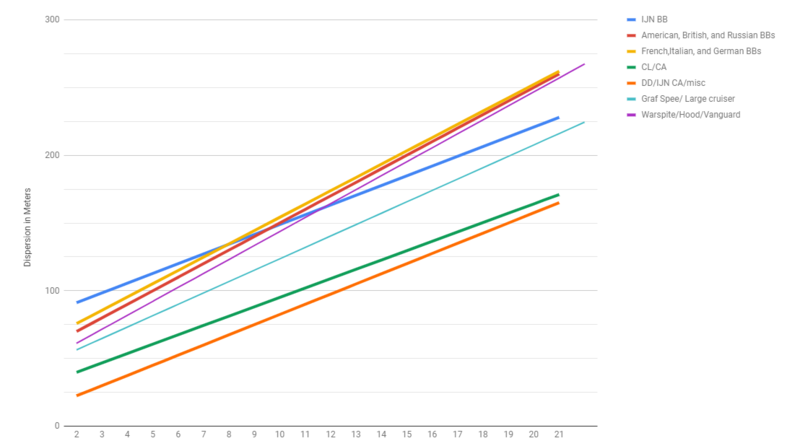 The graph below shows the dispersion curves for each ship in the game, followed by it's table and the formulas used. *These sections are exceptions, and replicate other dispersion formulas. Dispersion values are same for HE and AP shells of the same gun. The player's gun dispersion value can be modified by player's equipment and by enemy's camouflage. 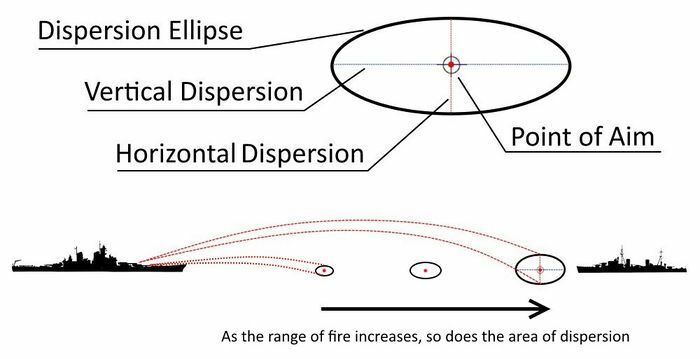 Gun Fire Control System Modification 2 decreases the area of the shell dispersion ellipse by 7%. Additionally, WarGaming has indicated that not acquiring the target with the X button increases dispersion by an unspecified amount. For patch 0.4.1, WG has decreased the close-range (i.e. below 4km) dispersion values for all ships. This page has been accessed 195,674 times.